A few minutes of yoga everyday provides the secret to feeling fresh and energetic even after a long day. Yoga poses massage organs and strengthen muscles; breathing techniques and meditation release stress and improve immunity. rounds. It helps to shred the weight and also known as king of the asanas. 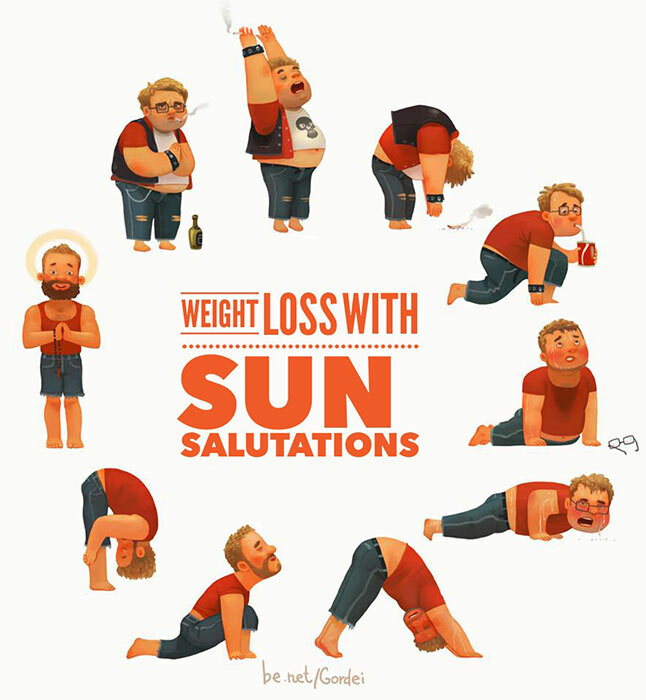 Practicing Sun Salutation at different speeds (slow, medium or fast) can have different effects. If done at a slow pace, it can help strengthen and tone body muscles. Use the breath as an effective tool in slow movements to bring the body, mind and breath in harmony and enjoy a complete meditative experience. A few rounds of quick Sun Salutations can be a great cardiac workout. If you are doing Surya Namaskar as a warm-up exercise, do it at a fast pace. But if Sun Salutation is included in the entire yoga posture package, you can do it at slow to medium pace. Yoga considered being more of aerobic exercise burns less calories during the workout compared to other strenuous workouts which are as effective. Yoga has its own sweet ways to cut the flab. Cobra pose helps to take deep breaths resulting in more oxygenated blood being pumped to different parts of the body. The oxygenated blood helps to burn the fat. Helps in toning the buttocks too. Bow pose is more of an advanced yoga pose but not only helps in burning the fat but also helps in toning of arms and legs. The Downward Facing Dog pose increases blood circulation to the brain and thus relieves headache. Come onto your fours. Form a table such that your back forms the table top and your hands and feet form the legs of the table. As you breath out lift the hips up, straightening the knees and elbows, form an inverted V-shape with the body. Exhale. Bend the knees, return to table pose. Relax. The Camel Pose or Ustrasana is the best yoga pose to reduce weight because it targets the tummy, back and thighs. Camel pose also helps for strengthening the back muscles, opening up the chest and lungs, improving the flexibility of the chest, abdomen and neck. Kneel on the yoga mat and place your hands on the hips. Your knees should be in line with the shoulders and the sole of your feet should be facing the ceiling. As you inhale, draw in your tail-bone towards the pubis as if being pulled from the navel. Simultaneously, arch your back and slide your palms over your feet till the arms are straight. Do not strain or flex your neck but keep it in a neutral position. Stay in this posture for a couple of breaths. Breathe out and slowly come back to the initial pose. Withdraw your hands and bring them back to your hips as you straighten up. 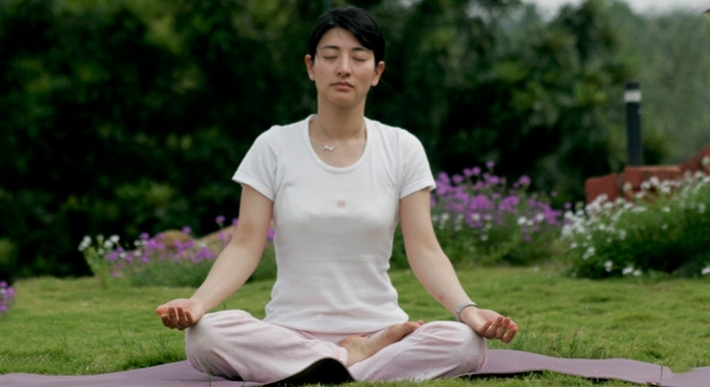 Padmasana helps you relax and clear your mind of tensions. The Padmasana yoga pose relaxes the mind and alleviates headache. Padmasana or Lotus pose is a cross-legged yoga posture which helps deepen meditation by calming the mind and alleviating various physical ailments. A regular practice of this posture aids in overall blossoming of the practitioner, just like a lotus; and hence the name Padmasana. Practising these simple yoga postures will lessen the impact of a migraine attack and may eventually stop them permanently. So, roll out the yoga mat, repose for some time everyday and shut migraine out of your life for good!